MERRITTVILLE, Ontario – Matt Sheppard drove past Gary Lindberg in the outside lane to take the lead on lap 85 and then paced the final 16 laps to win his second straight Bob St. Amand Memorial 100 at Merrittville Speedway on Wednesday night. 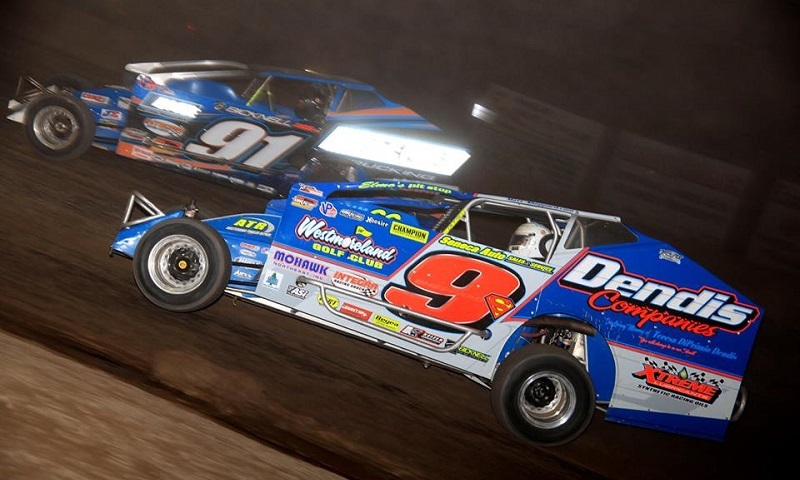 The victory was also his fourth straight with the Super DIRTcar Series and second in as many nights, after he also won Tuesday at Ransomville Speedway. Lindberg, a Merrittville weekly 358 (Small Block) Modified regular, gave everything he had to keep pace with Sheppard, but came up 1.203 seconds short of his first career Series victory. Sheppard’s good luck was at the expense of Erick Rudolph’s misfortune during the most dramatic point of the race. Lindberg and Rudolph had broken away from the rest of the pack in the top two spots. As the race reached its final quarter, Rudolph zeroed in on Lindberg among the lapped traffic and pulled to his back bumper, all after erasing a two-second deficit. However, Rudolph’s bid for the lead ended with 81 laps completed when he tried to race under Lindberg, who was running a half groove off the bottom of the track in turn three. The two drivers made contact in the middle of the corner, and the result was Rudolph facing the wrong way in front of the field. The ensuing restart moved Sheppard from third to the outside of the front row beside Lindberg. The Waterloo, N.Y. native made the most of the outside groove and took the lead from Lindberg on lap 85, after a four-lap side-by-side battle on the icy slick track. While Sheppard held the point, Lindberg kept within striking distance over the next 10 laps, until the final caution flag of the race waved with five laps remaining when Fred Carleton rode the outside retaining wall to a stop on the frontstretch. Contrary to most situations, Sheppard was actually happy to see the yellow flag. Sheppard and many of the drivers resorted to dipping the right-side wheels into the moat on the frontstretch to find grip for the straightaway, which was devoid of moisture elsewhere. That same slick track played to the benefit of Lindberg and the other Merrittville Small Block regulars. Billy Decker completed the podium with a third-place finish. Decker’s second top-three result in as many nights extended his point lead over Larry Wight, who finished ninth. Prior to the lap 81 caution, the race had run under green conditions all the way from a lap 30 restart. Max McLaughlin was the night’s Fast Qualifier with a lap of 16.692 seconds and the winner of heat two. Sheppard, Ryan Susice and Decker also picked up heat race wins. Mark D’Ilario won the Last Chance Qualifier. For Sheppard, the win was another step in the right direction towards climbing up the points ladder. Entering Wednesday’s event, he was 115 points back of Decker. “All we can do is keep trying to win these races and let the rest take care of itself,” Sheppard said. Sheppard will get the chance to try for his fifth straight win when the Super DIRTcar Series returns to action on Aug. 24 at Ohsweken Speedway for the Triple Crown Showdown.